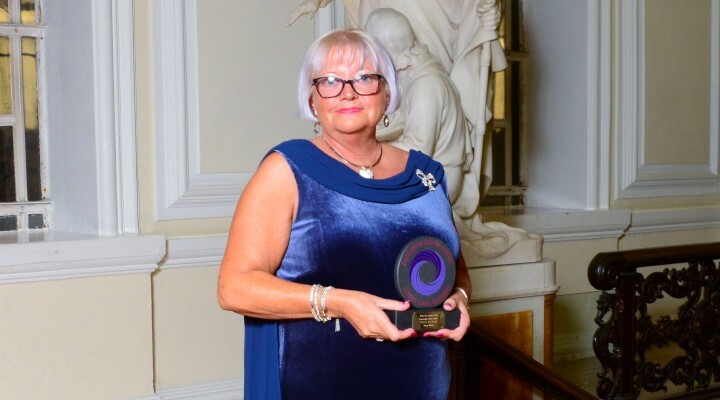 A Bargoed woman who has carried her deep commitment to putting people in her care first throughout her rise from the nurse to senior care homes executive has taken bronze in major national awards. As a young nurse working in the National Health Service Cheryl Wanklyn realised how vital is was to allow patients their privacy and dignity. Many years later and now operations director for a large group of care homes where colleagues describe her as an “inspiration”, she says these things are still as important to her as ever. It is this dedication to her caring role that saw 64-year-old Cheryl take bronze in prestigious national competition, the 2018 Wales Care Awards. She was shortlisted for the Outstanding Service Award, sponsored by Hallmark Care Homes. Originally from Bargoed, Cheryl trained as a nurse at the Royal Gwent Hospital in Newport immediately after leaving school. Over the next 15 year she went on to work on the wards of NHS hospitals in Cardiff, Newport and Chepstow and became the first Enrolled Nurse in Wales to complete a conversion to Registered Nurse Level 1. In 1995 Cheryl, who still lives in Newport, has been married to husband David for the past 38 years and has two grown-up sons, switched from the NHS to the private sector when she took on the role of manager of the Cherry Tree nursing home in Caldecott, which was eventually taken over by Hallmark Care Homes. In 2002 she began her rise to the top of the company when she was appointed its regional manager for Wales, then a few years later regional director for Wales and eventually operations director for the whole company responsible for all 17 of its care homes in England and South Wales. The Welsh homes include three in Cardiff and others in Caldecott, Merthyr Tydfil, the Rhondda, Maesteg and Ammanford. Although Hallmark is based in Essex, Cheryl spends a good deal of her time overseeing and visiting the homes in Wales. She said: “The job is not office based and I like to call in to see them as often as possible and to be part of what they do. I try to lead by example and empower the team but as a partner in what they are doing. “I speak at least once a week to the managers of our Welsh homes and know exactly what is happening with them all. “During my nurse training with the NHS I learned that the privacy and dignity of patients was very important and when in care people should be able to have as normal a life as possible. In Cheryl’s nomination for the award Hallmark’s current reguional manager for Wales Debbie South said of her: “She leads her team with compassion and empathy, she is always on hand for advice, day or night, and always goes the extra mile to support and encourage her team. “Always positive, she seems to have sixth sense when it comes to predicting outcomes and will gently steer her team to finding the right track and getting back on course with their journey. “I can honestly say her her attitude is a shining example of the difference we can make to people’s lives. Cheryl said of her nomination: “I was absolutely amazed by it but feel really pleased and very humble.